The joke is that they look like a turkey, which is your dinner. You might not be eating them, but it’s funny to joke that you might be. It’s dark comedy. Do you like dark comedy? Here’s a photo of my dog a few years ago wearing a turkey drumstick headband on Thanksgiving. A good choice, in my opinion. Turkey Deluxe Thanksgiving/Halloween Costume: This one is pricey, but the turkey memories last forever. 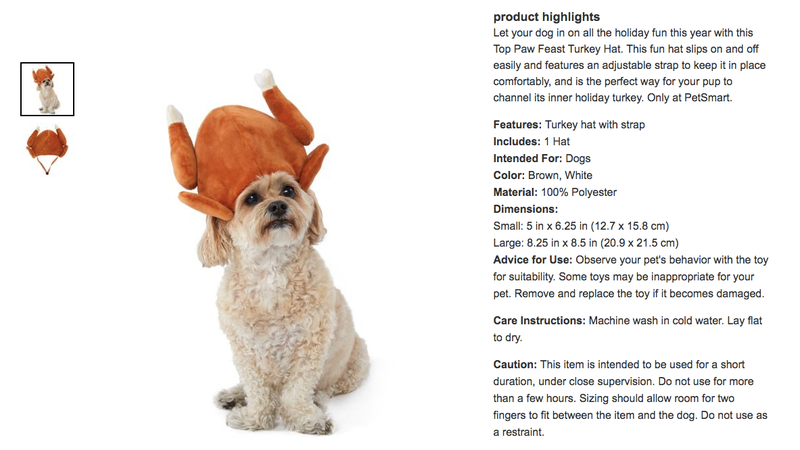 Turkey Drumstick Headband: Do you have a cat? Got you covered. Turkey cat costume: Your cat’s gonna flick this off their face in 5 seconds but maybe you can get a good Instagram out of it. You can’t buy this one, but I’d like you all to take notes. Just look at how realistic that is. Your friends and loved ones will come over and say, wow, that’s so cute, but also what’s wrong with you? Please, dress up your dogs as food whenever possible. It’s good for them and it’s good for you. Pilgrims, Native Americans, and other glamorizing stereotypes of Thanksgiving are not allowed, thank you.